Expansion Chamber Exhaust; Muffler combo adds more power to your motorized bicycle. It is designed to run best on a 66/80cc engine, but it will still add a lot of power to your 48/49cc engine. 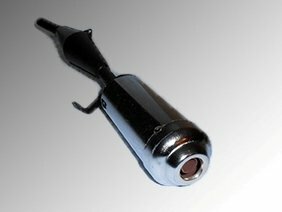 Our Expansion Exhaust pipe will also give your bike a more “throaty” sound. In addition, they dramatically increase your low and mid-range power while still giving a bit of a boost at the top end. These are designed for motorized bicycle 2-stroke engines, and the header length; expansion chamber size has been developed over much testing. Please note: they will fit standard exhaust studs on 48/49cc; 66/80cc 2-stroke bicycle engines. You WILL have to bend the pipe’s header to fit your particular bike. That means that you will need a vice & torch to bend this. OR you can take it (with your bike) to a muffler shop and pay to have it done. (Typically, costing around $10) *** SAFETY NOTICE: (as pictured) we STRONGLY suggest that you wrap it in exhaust wrap. Exhaust wrap is not included. If you don’t know where to purchase exhaust wrap, please ask. We are not responsible for burns that result from wrapped or unwrapped pipes. Your purchase of this product accepts this condition, for it is a binding contract. Therefore, please purchase Exhaust Wrap and apply. ALWAYS be safe and cautious, for this product can cause burns if not handled correctly.Great performance upgrade to your 2-stroke motorized bicycle. Adds more power and gives your engine a more “throaty” sound.